Good morning! Can you believe it's just 15 days until Christmas? Yikes! Every year I mean to do a December Daily album, but I never get to it. Since this is day 10, I guess I'll try again next year. Now onto my card... today it's a fairly simple one. I'm working on some gifts and have been wracking my brain trying to come up with ideas. I think I'm going to make some simple card sets, and this is one of the cards. 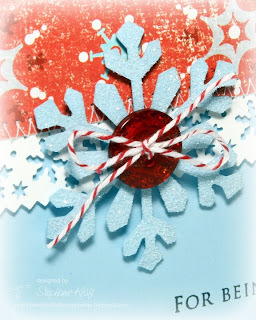 My patterned paper is part of a fun pack that I found at Target this week - Making Memories Tinsel. Stacy and I are currently glitter fanatics, and I'm doing my best to try to use some of mine! Here's a detail shot of the fine glitter on the snowflake. I topped my snowflake with a button and some baker's twine. The weather has finally cooled off here, so that means Sabrina and I have caught a cold (actually, we are on the fence -- not quite well but not fully sick... yet). Of course, this is no time to be sick as Sabrina has 6 more days of school and a couple of class parties before winter break. I still need to finish decorating our tree, shop for Christmas, wrap presents, make gifts, bake cookies AND send out our Christmas cards, then we are off to CA for an early Christmas with my family. So, in case my posts seem sporadic for the next couple of weeks, you'll know why! Thanks so much for stopping by today! One more day until the weekend! Accessories: Snowflake border punch, Large snowflake, Baker's twine, Glitter (Martha Stewart); Button (Papertrey Ink), Foam tape, Thread, Sewing machine. You may say it ia simple, I say it is Beautiful!!! 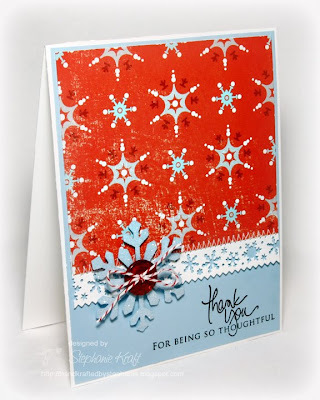 Love the color combo & that snowflake, button & ribbon is a perfect touch. Beautiful!! The snowflake is awesome. So pretty! I love the blue and red together!